Boulder County Real Estate Statistics for August 2017 | Kearney Realty Co. 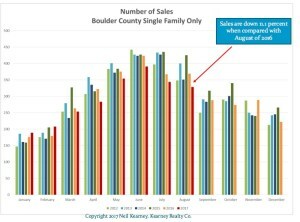 The real estate statistics for Boulder County for the last few months have shown a shift in the market. August continued this trend. Sales during the month were 11% lower than last year and lower than any August since 2011. We are seeing more price reductions, more negotiation room and it’s taking longer for homes to sell. It seems that we are shifting away from a strong sellers market to a more balanced market. View the presentation below to see multiple statistics pointing in the same direction.